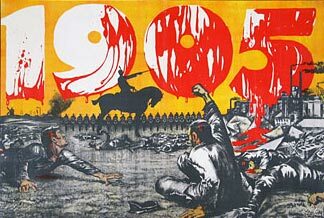 The October Manifesto was the outcome of the 1905 Revolution. The document vaguely promised to grant an elected legislative body, civil and religious liberties, and the right to organize unions and political parties (Freeze 255). The revolution was the culmination of different movements within Russia to change the current political order. The first of the movements was from the workers who were causing so much civil unrest, it was turning into revolutionary acts (Freeze 252). The Shidlovsky commission was created just to hear their grievances and allowed them some voting powers (Freeze 253). This soon escalated into the creation of a shadow government, led by Marxist Leon Trotsky. The peasants and liberal professionals soon became involved in this shadow government, and there were discussions about creating advisory and consultative bodies but none granted legislative independence (Freeze 254). Thus led to the October Manifesto that had “enough substance to divide the opposition” (Freeze 255). The Manifesto called for the “improvement of order in the state” and laid out the reason why there needed to be a change in the government and the reasons it should concern those with higher authority. The manifesto calls for: fundamental civil freedoms including freedom of speech, conscience, assembly, and association; participation in the Duma was granted to those who previously did not hold voting rights, excluding women; and no law is allowed to come into power unless the state Duma vote and approve it and the state representatives of the people will be given opportunity to take part in the governing and regulation of the people. Although the manifesto did not appease all of the grievances of the people, it created a calm enough environment to allow for the government to get the revolutionaries and workers under control and arrest the Petersburg soviet. According to Freeze, the manifesto broke the back of the revolution and the army began obeying the government again. However, it is interesting that this manifesto still did not provide all of the desires of the people. There needed to be more solid provisions in place to continue to modify the structure of the government in order to prevent more revolutionary upheaval from the people. The most interesting thing about the October Manifesto to me is the fact that there is a lack of completely following the desires of the people. The government struggled to calm the people in a situation where they were beginning a revolution. It does not seem to be favorable to not continue to improve upon their structure and create a peaceful system that includes their input into the structures of government. This leaves an open door for more complaints and unrest. The delicate material panel drapes easily from high grommets and adds splendid model to décor. I’d like to hear more about the manifesto’s “open doors”! Did you find any articles in the New York Times about the hopes (and fears) behind the manifesto? Interesting post, I read the manifesto as a “band-aid” that like you mentioned only answered some of the revolutionaries problems. Great work emphasizing that in your post and good organization.